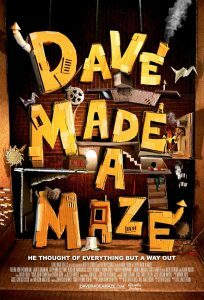 Bill Watterson’s directorial debut Dave Made a Maze is a quirky fantasy/adventure comedy that boasts plenty of hilarious riffs on horror, along with some genuine suspense and chills. The film is a fun, imaginative outing that is one of the most unique pieces of cinema this year. Dave (Nick Thune) is an artist who has a difficult time completing his projects, and therefore gaining any self-worth or notoriety. He begins building a cardboard fort in the apartment that he shares with his girlfriend Annie (Meera Rohit Kumbhani) and finds himself lost inside the construction, in a maze of his own making. Annie calls Dave’s friend Gordon (Adam Busch), who invites along filmmaker Harry (James Urbaniak) and his crew, and before long — and against Dave’s pleading — a large group of people enter the fort to see what’s happening. As everyone soon discovers, they should have heeded Dave’s warnings. The mystical world inside the cardboard walls is much larger than the actual physical space of the fort itself, and danger lurks around every corner. Members of the group start meeting their demises in ways that will delight fright-film fans. What Watterson, art director Jeff White, and the art department staff members substitute for traditional blood and gore effects is both riotously effective and strangely chilling. Deaths occur in a variety of ways, and different types of evil creatures lurk within the maze. To go into much further detail would spoil some of the myriad surprises that Dave Made a Maze holds. Just know that eeriness and some creative kills await viewers. White and the art department crew show a great deal of imagination and effort bringing to life the madcap world sprung from the minds of Watterson and his co-writer Steven Sears. The maze feels like a living, breathing character itself thanks to the wildly creative cardboard-and-paper sets. One scene in a forced-perspective room is jaw-dropping in its optical trickery. Watterson, an actor whose many roles include Ouija, has assembled a talented cast that knows comic timing and that can pull off dramatic moments handily, as well. He helms the proceedings with a confident hand and an eye for mesmerising visuals. 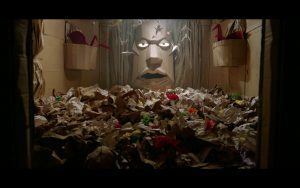 Dave Made a Maze offers plenty of entertainment for genre-film fans in a warm-hearted comedy that has been deservedly winning “best film” awards on its festival run. There’s so much to enjoy in this movie, which has a huge heart, as well as a soft spot for fear fare. 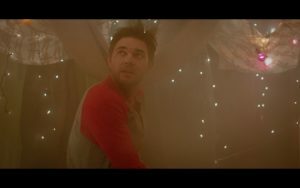 Dave Made a Maze screens at Popcorn Frights Film Festival (Miami, Florida, running now through August 17), and opens in theatres and on VOD on August 18, from Gravitas Ventures.